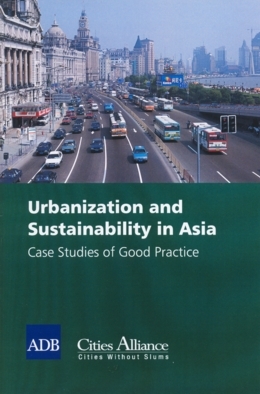 The book presents case studies of good practice on sustainable urban development from 12 Asian countries: Bangladesh, Cambodia, People's Republic of China, India, Indonesia, Lao People's Democratic Republic, Malaysia, Pakistan, Philippines, Sri Lanka, Thailand, and Viet Nam. It provides insights into current issues, management approach, and investment types in urban development in Asian setting. It also provides other examples of good practice in sustainable urban development in the context of more advanced economies. It is a useful reference for city managers, political leaders, and professionals responsible for planning and managing the development of cities. 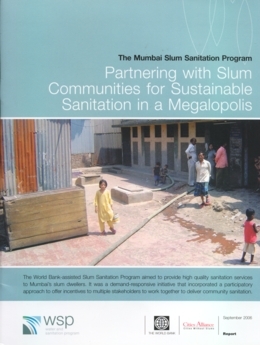 concerns because poor sanitation has a wide variety of negative impacts. water, other welfare indicators, and tourism. The health impacts represent the largest source of quantified economic costs. Estimated to be about US$1 billion, this item explains about 71% of the total. tourism were also estimated to exceed US$77 million per year. resources and can reduce costs by US$364 million. value of human excreta used for fertilizer. 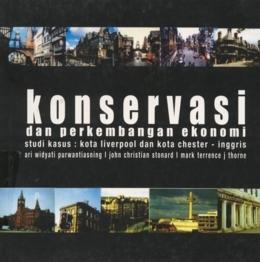 Studi ini meneliti pendanaan publik dalam pengoperasian dan investasi pada sektor AMPL pasca-desentralisasi, yaitu 2003-2005. 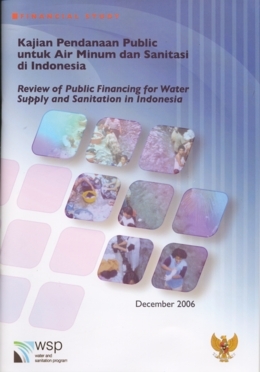 Kajian ini menganalisis alokasi dana yang dilakukan oleh Departemen Kesehatan dan Departemen Pekerjaan Umum pada tingkat pusat, dan pada tujuh propinsi, dua kota dan 19 kabupaten yang berpartisipasi pada proyek Water Supply and Sanitation Policy Action Planning (WASPOLA). Studi ini memberikan gambaran besaran dan kualitas investasi yang telah dilakukan pada sektor AMPL di era desentralisasi sebagai sarana memahami permasalahan-permasalahan mendasar terkait dengan kesenjangan dalam pendanaan sektor. Laporan studi ini dipaparkan dalam bahasa Inggris. Pustaka ini memperkenalkan 21 good practices dalam kegiatan lingkungan berbasis masyarakat di Indonesia. Pustaka ini disusun sebagai sarana untuk berbagi pengetahuan dan pengalaman dalam kegiatan lingkungan berbasis masyarakat, untuk para pakar yang terlibat dalam pendidikan lingkungan dari lembaga-lembaga terkait, termasuk instansi pemerintah pusat dan daerah, LSM, perusahaan swasta dan lembaga donor, agar nantinya kegiatan lingkungan menjadi semakin baik. Kegiatan lingkungan yang disebutkan dalam pustaka ini meliputi konservasi hutan, konservasi air dan tanah, konservasi ekosistem, dan pengelolaan sampah dengan 3R. 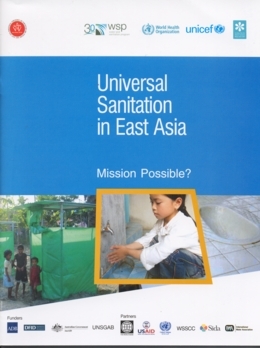 Universal Sanitation in East Asia: Mission Possible? Hygiene-don't Forget to wash Your Hands with Soap! 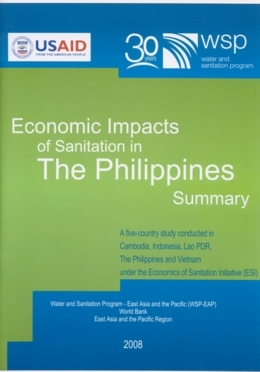 The Sanitation Impact Study was conducted in Cambodia, Indonesia, the Philippines and Vietnam. A study is ongoing in Lao PDR. 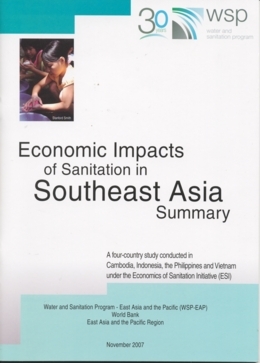 The study was led by the East Asia and Pacific office of the World Bank’s Water and Sanitation Program (WSP), with the contribution of WSP teams in each of the participating countries. The study took one year to complete, and has undergone two major peer review processes. This summary report is based on four fulllength country reports and a full-length synthesis report. 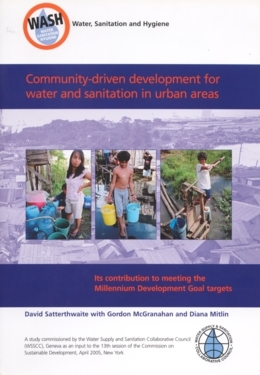 of poor sanitation can be mitigated by investing in improved sanitation. The study is based on evidence from other investigations, surveys and databases. 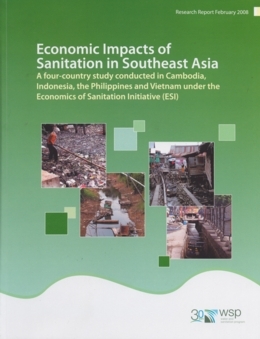 The impact measurement reported in the study focuses mainly on a narrow definition of sanitation - human excreta management and related hygiene practices. The measurement of water resource impact included release of gray water to water bodies, and the measurement of environmental impact included poor solid waste management. ecological sanitation approaches (fertilizer and biogas) would be worth an estimated US$270 million annually.